The following is an excerpt from our inaugural Traffic Titans Report. For more actionable, cross-channel data and insights, you can download the full report here. All data and insights is obtained from the DemandJump Traffic Cloud® - Customer Acquisition platform, unless otherwise cited. We could write ten of these posts on search alone, but we need to draw the line somewhere. Therefore, this article will focus on search holistically, as well as paid vs. organic. Note, if you are looking for more information about specific search channels, topics, or keywords as they relate to you and your competitors, please reach out to DemandJump. We would be happy to provide more details to qualifying brands. For out Titans, and many others, it is clear that search accounts for the vast majority of website traffic, with the exception of direct visitors. In 2018, Google’s search revenues are expected to reach $32.40 billion of the $40.49 billion industry. That’s 80% of the total revenue - and growing every year. Additionally, 74.54% of all web searches globally take place on Google. It’s safe to say that “search” and “Google” are fairly synonymous - but don't let that fool you. There are powerful opportunities across many other paid and organic search channels. Bing, DuckDuckGo, Yahoo, and Baidu are all important players, where many savvy marketers are finding meaningful growth marketing opportunities. Finally, before we dive in, don’t overlook the power of Shopping campaigns and Image Search. It’s easy for marketers’ default perception of search to be text ads, but it’s important to know it’s much more than that. Let's dig into some data. The graph below shows the distribution of the total share of all search traffic for our Titans. The Home Depot drives the most with about 32% of the total market. Target is just behind The Home Depot with 31%. Best Buy has about 24% of the total share, followed by Nike with 14%. Keep in mind that Nike is also the smallest website of this group. So just because they drive the least traffic from search, does not mean they are underperforming. The graph above shows total traffic from Google organic search between January 2017 and January 2018. You can again see Nike driving less traffic than the other Titans, but the percent of total traffic is actually much more even across the ecosystem. The Home Depot has the highest at 35%, while Nike is the the lowest, but still driving about 25% of their total traffic from Google organic search. In the next visual, we see the exact same data, except it is filtered by traffic from Google paid search only. Again, we see Nike driving the least traffic, however they are generating >9% of total traffic from this channel. Total search traffic remains relatively consistent, with a moderate lift generated between October 2017 and December 2017. Of course, when we say “moderate”, we are talking about somewhere between 25,000,000 and 100,000,000 monthly visitors (depending on the month). But relative to the percentage lift we see across other channels, search is actually the smallest (download the full report here). The graph above shows the same breakdown but we pivoted by individual competitors. We again see Nike and The Home Depot generating insignificant lift during holiday. Target ramps up traffic in a big way, and Best Buy also generates a nice lift in qualified traffic. Best Buy and Target get flooded with Google organic search traffic in November. This is easily attributable to increased advertising spend, both on and offline, which inspires consumers to search for these brands. This is a prime example of the close ties between on and offline marketing, as well as the close relation between channels. Marketing does not happen in silos. Target and Best Buy are also two of the largest players in the U.S. for Black Friday and Cyber Monday inspired advertising - which are clearly major drivers of qualified traffic in November. The figure above once again shows a fairly consistent spread of market share for all search traffic throughout the year. The Home Depot expands share mildly throughout the spring and summer months, while Target and Best Buy expand their share during holiday. One important anomaly here is Target’s continued expansion in December of 2017. We often see a cross-channel drop after November as brands wrongfully become content with their “set it and forget it” holiday strategies. It’s absolutely critical for these companies to keep their foot on the gas through December, iterating and adjusting in real time as busy shoppers continue to spend money. Jordan brand is a staple of Nike’s vast collection of products and product lines. This single keyword drives massive amounts of organic search traffic throughout the entire year. Michael still reigns! 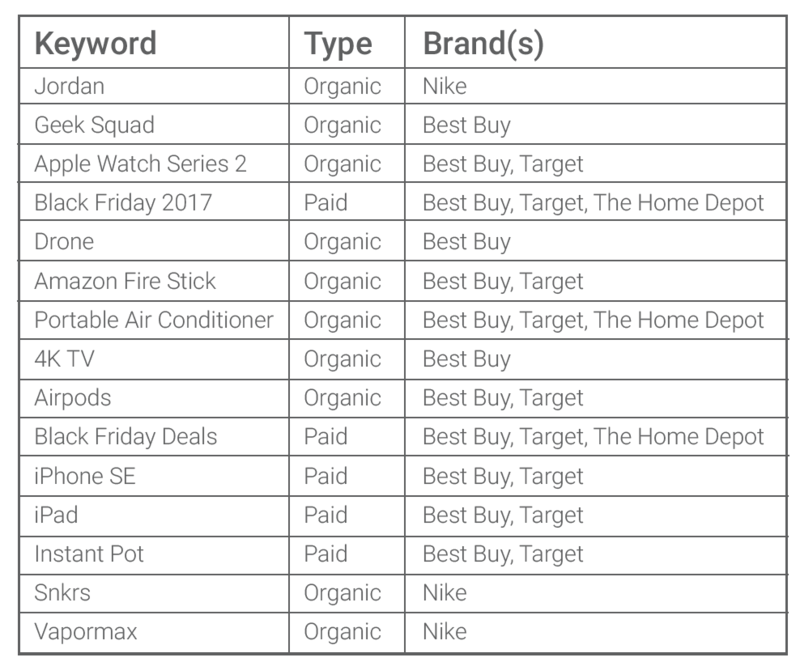 The paid keyword “Black Friday 2017” drives traffic to Target, Best Buy, and The Home Depot, with Target being far and away the leading generator of qualified traffic. Harnessing the power of search is one of the most dangerous weapons that any marketing organization can have. Search drives the lion-share of qualified traffic when it comes to digital, and there aren’t any signs of that changing anytime soon. It’s critically important for brands to dominate the categories and keywords that matter most to them. To do this, marketers must know the way their consumers are actually searching, not just the way they think their consumers are searching. Monitor market dynamics, adjust in real time, and stay ahead of the competition. For top brands, outstanding search performance is simply non-negotiable. Without it, you are stuck in a hole that is not easy to climb out of. Search has become so complex that it is truly impossible for a human to use only basic tools to inform strategy and execution. Marketers are shocked when we show them their actual annual unique search terms run in the tens of thousands, and even hundreds of thousands. Math must be used to understand how to best structure and execute accounts. Remember, the amount you are bidding is just one small step in the equation. Bidding is simply for tweaking or coming over the top to strategically own a keyword. Targeting the right mix of keywords and campaigns is the foundation to winning.